Misfolded aggregates of tau and Aß proteins form tangles and plaques in the brain, which are a classic characterization of Alzheimer's disease. However, according to emerging evidence, neuroinflammation, which is mediated by activated glial cells, plays an important role in the pathogenesis of Alzheimer's disease. Therefore, understanding the interactions between the immune and nervous systems may play a pivotal role in the delay or prevention of neurodegenerative diseases. 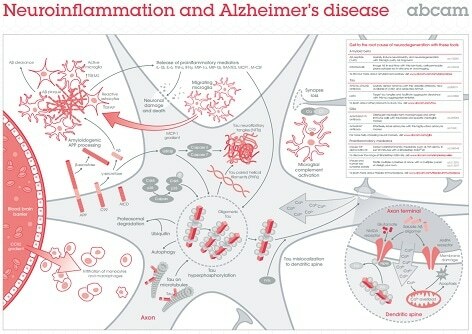 This poster gives a summary of the involvement of Aß and tau proteins in Alzheimer's disease, and demonstrates the role of astrocytes and microglia in producing an inflammatory environment.